Street Fighter IV was an exuberant return to the days of classic arcade fighters. It was a game designed specifically to reel back in aging gamers who once dropped pounds of quarters on virtual tournament in arcades around the world. But, it turns out, many of those aging gamers don't have consoles and aren't planning to buy them. Enter the iPhone, the perfect way to get the splendor of Street Fighter IV into those 40-year-old gamers' hands. But Street Fighter IV has no physical sticks or buttons. And the virtual controls it has consist of a direction pad and only four attack buttons—punch, kick, focus attack and special. Can a good looking adaptation of a solid fighter succeed without controllers or is it joystick or death for Street Fighter fans? The Look: The gameplay on a 3GS iPhone is seamless, fluid and a surprisingly solid replication of what you see when you play on a television or in an arcade. Each of the eight fighters (Abel, Blanka, Chun-Li, Ryu, M. Bison, Dhalsim, Guile and Ken) and seven environments are minutely detailed. I asked the developers how they managed it and they declined to say, only indicating that it was the sort of technical feat that ended friendships and caused gray hairs. The Touch: This is what it all comes down to. How does Street Fighter IV play without any physical controllers and only four buttons. Surprisingly well. Sure a lot of the nuance of the game is stripped away, but the contextual controls, which decide what sort of punch or kick you're going to throw based on the situation, do an adequate job of letting you replicate the most common combos despite having only one virtual kick and one virtual punch button to tap. Special attacks are fairly easy to pull off and, if you're not up to it, you can even turn on an assist mode that strips specials down to a single button push and joystick position. What this does, in essence, is forces players to concentrate more on tactics and less on joystick maneuvering abilities. And that works for me. The Sound of One Person Gaming: Street Fighter IV's biggest issue is that the game only supports local multiplayer over Bluetooth. And the folks behind the game assured me that won't be changing. Why? Because they don't want lag. That sounds like a bit of a cop out to me. What about WiFi-only online play? Or at least attempting a solution? As an adult gaming living in the suburbs my chances of catching some one-versus-one action on this game are virtually nil. Instead I have to make do with seven different challengers and four difficulty settings. Very disappointing. I love this game, really love it, but I can only play it so much by myself. Sure, I could pick up a copy for my son, try to convince neighbors to buy the game, but really the only solution to my problem is for Capcom to add some form of online play. Something they've told me won't be happening. What are the other options for me? Hope for the hinted at inclusion of new characters? Play a couple of times a year when I'm at places like E3 or PAX? Not good enough dammit. It's like being given a juicy sirloin but only being able to lick it. Until Capcom comes to their senses and adds online play, I'd suggest anyone who isn't sure if they have local friends to take on give the $10 game a pass. 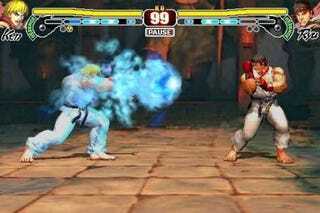 Street Fighter IV iPhone was developed and published by Capcom for the iPhone and iPod Touch on March 10. Retails for $9.99 USD. A copy of the game was given to us by the publisher for reviewing purposes. Played through the game's solo play tournament (about a ten minute experience) a half dozen times. Did some free sparring, training and unlocked a dozen or so Dojo challenges.